Fishing for hatchery trout is different than fishing for wild rainbows. 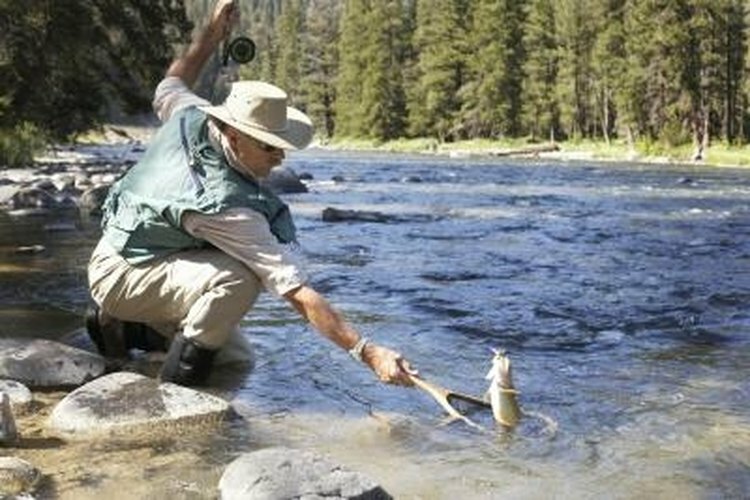 Catching rainbow trout that were raised in a hatchery presents a number of problems for a fisherman. Stocked trout were raised in a small, confined area and were given food at regular intervals. In addition, these trout were acclimated to live at a certain depth in the water and at a constant temperature. These factors make stock trout no more or less predictable than wild trout, but certainly different. Just as fishing for wild rainbows is sometimes considered an art, sometimes a science, fishing for stock trout requires intuition and experimentation. Bring different lures, baits and flies. A variety of different attractants equals an increase in your odds of baiting the fish. Knowing what the fish are hitting is as important as having a variety of attractants. If there is a hatch in the air and you notice the fish feeding, find something similar in shape and size in your tackle box and tie it on your line.However, be aware that stock fish were conditioned to eat manufactured food. As a result, hatches may not attract them the same way such cycles attract a wild rainbow. This being the case, try power and hook baits that resemble or smell similar to fish pellets as well. Fish at different depths. If you can get a few hits at a certain depth, you will at least know where the stock rainbows are laying in wait. Just a few degrees of difference in water temperature will cause a fish to settle or rise. Constantly changing your attractant does no good if you always fish at the same depth. Fish holes, not random areas. Fish naturally sit behind rocks and outcroppings that are insulated from the current. Fish will sit in an area where the current moves food past them. It is a means for the fish to save energy. Stock rainbow trout are no different. Even ponds and lakes have currents. The larger the body of water, the greater the current, true, but all bodies of water have current. Fish with more than one pole. For example, you might use one pole with a bobber and salmon eggs or a worm, use power bait on another and cast a lure or spinner with the third pole. The more poles you use, the greater the odds you have of attracting a fish. JRW Fishing.com: The Best Trout Bait?